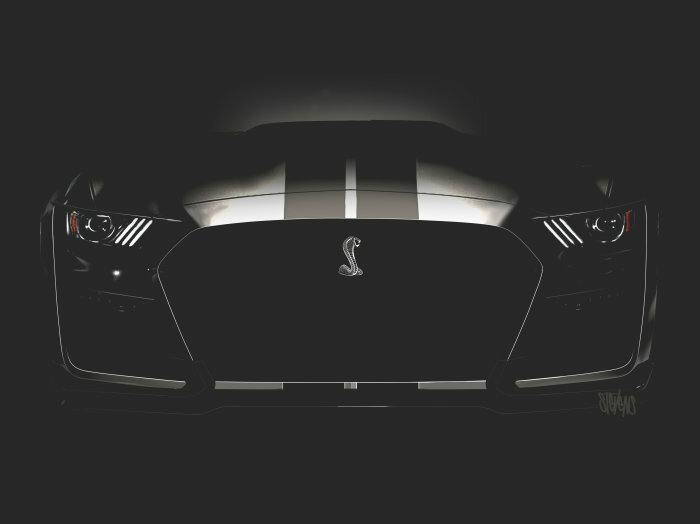 We know that the Ford Mustang Shelby GT500 is going to return in the next year and when it does, there are three things that the newest super-muscle car could use to climb to the top of the segment. Ford Motor Company has offered a supercharged, big-power Mustang since the 2014 model year, leaving the horsepower war to be fought between the Dodge Challenger and Chevrolet Camaro for the 2015-2018 model years. That should change for 2019 or 2020, with the introduction of the new Ford Mustang Shelby GT500. Ford has issued the teaser image above and the short video below, but we really don’t know anything about the car thus far. While we don’t have any real details on the next generation super-Stang, there have been an assortment of rumors floating around the internet pertaining to things like the engine, the power levels and the transmission options. With those rumors in mind, today we bring you a list of 5 things that I think that the next GT500 could use to properly compete with the Hellcat Challenger and the Camaro ZL1. First and foremost, the Ford Mustang Shelby GT500 is going to need to offer more power than the Hellcat Challenger or the Camaro ZL1. With the Challenger packing 707hp and 650lb-ft of torque and the Camaro offering 650hp and 650lb-ft of torque, with the promise of the Mustang having at least 700 horsepower, it seems likely that the Motor Company will aim to overpower those key competitors. There was a rumor a while back that the teaser image of the new 2018 Mustang, with 7th gear and 72 miles per hour displayed, was a hint at 772 horsepower in the new GT500. It would be awesome if Ford aims that high, but even if the actual output is lower – the new Ford needs to beat the Challenger and Camaro by clear margins. At 725 horsepower, it beats the Camaro by a large amount while beating the Challenger by a smaller, yet numerically significant gap. In marketing materials, 725 looks a whole lot bigger than 707, so while 772 would be awesome, anything higher than 725 would get the job done. Along the same lines, 660 lb-ft of torque would allow the new Shelby Mustang to beat both supercharged competitors in an area where the current GT350 suffers. In either case, the self-shifting GT500 will likely offer the greatest performance, but a manual transmission is a must-have feature. Performance, fuel economy and every other measureable figure aside, a proper muscle car should have a manual transmission in addition to a lightning-quick automatic. The Dodge Challenger SRT Hellcat and Chevrolet Camaro ZL1 both run in the lower 11s in stock form, with the quickest stock-to-the-tires Hellcat car cracking into the high 10s. With drag radials, the Chevy and Dodge are very capable of running in the high 10s, so when the new GT500 arrives, it absolutely has to have stock 10-second capabilities. Even if the GT500 is built to handle a road course as well as a drag strip, there is no question that drag racing is a key focus of the muscle car owners community, so this new Shelby Mustang will need to be able to hold its own against the supercharged competition. Realistically, an official 11.0 or 11.1 would be enough to officially beat the Challenger and Camaro, but with good tires – this new Mustang absolutely has to run 10s to be taken seriously. Although the Chevrolet Camaro ZL1 and Dodge Challenger SRT Hellcat are premium performance models, they are also loaded on the inside. The Challenger, for example, comes with heated and cooled leather front seats, a heated steering wheel, dual zone climate control, driver-selectable gauges, a premium speaker system and a state of the art infotainment package. The Camaro isn’t quite as well appointed, but like the Dodge, the supercharged Chevy has premium gadgets. For the upcoming Ford Mustang Shelby GT500 to properly battle the cross-town competition, it will need to come with comparable gadgets. Fortunately, the fully digital gauge cluster and the infotainment system in the 2018 Mustang GT will do the job nicely, perhaps with the option of some heated and cooled leather buckets as an option to Recaro race seats – or vice versa. Perhaps most importantly, the new Ford Mustang Shelby GT500 has to have a starting price below $70,000 with Gas Guzzler Tax and destination fees. The Hellcat Challenger starts at $67,340 and the Camaro ZL1 starts at $63,795. Provided that the Mustang has comparable interior amenities and better performance capabilities than the other two, it should cost more, but just how much more? Ford would be smart to market the car as starting under $70,000, presumably with a price of $69,995 with those aforementioned fees. That would make it only slightly more expensive than the Challenger, slightly more expensive than the current GT350R and well below the Corvette ZR1 that has 755 horsepower. Unfortunately, we might be waiting for as much as a year until we get the full details on the new Mustang Shelby GT500, but with any luck, Ford will roll out more information between now and then. Shelby GT 500 Mustang could be more lightweight. While ford has teased what the front end looks like, they haven't even confirmed the car exists outside a concept. People are saying its a 2019 because they are expecting it to be announced next year, but if that happens it would release as a 2020 model year. To be released as a 2019, they would already have to have ordering setup and be in production for a sept or Oct release. Only other way would to do it as a special mid model year release sometime early next spring like they did with the Dodge demon. But Ford doesn't have a track record of doing things like that except for the mustangs initial release in 64.